Eurobins are a familiar and common fixture on the streets and alleys of Britain, their normal function is to store rubbish until the local Waste Management Engineer (aka: garbage man) comes around. They’re very popular, and as a result, they’re everywhere…thousands of them. So what do you do with the ones that are worn out and have reached the end of their useful life as a rubbish bin? 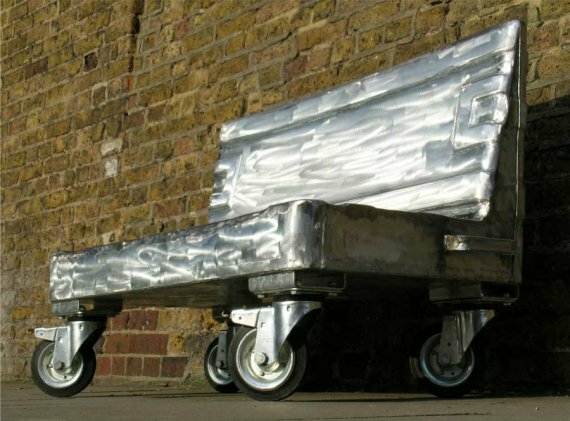 Well, the designers at WEmake have put out plans that show you how to make an old Eurobin into the Street Sofa. The plans are free to download, and all it takes is a little cutting, welding, and grinding, and you’ve got yourself some industrial chic furniture that you made all by yourself. Get the Street Sofa plans – here. Visit the WEmake website – here.